1. According to bilateral agreements between China and foreign countries, citizens of some countries who meet requirements set out in the bilateral agreements may enter China without a visa. You may read for details the List of Agreements on Mutual Visa Exemption Between China and Foreign Countries. The Philippine Diplomatic or Official passport holders are exempted from visa requirement for temporary visits to China for a period not exceeding 30 days (Note:The Philippine Official passport is issued to members of the Philippine government for use on official business). 2. Hold connected passenger tickets and are in transit to a third country or region by an international aircraft, ship or train via China, will stay for not more than 24 hours in China without leaving the port of entry. 3. Citizens of the following 51 countries, who hold valid passports with confirmed onward tickets and seats on international flights and transit through to a third country or region, can apply to stay in the transit city without visa for 72 hours via the following airports: PEK, PVG, SHA, CAN, CTU, CKG, SHE, DLC, XIY, HGH, KWL, KMG, XMN, WUH, TSN, HRB, TAO, CSX. (For more information, please check the website of the transit airport). FAQ On 72-hour Transit Visa Exemption for Foreign Nationals. 4. Citizens of the countries having diplomatic relations with China holding ordinary passports and on a tour to Hong Kong or Macao, and participating in group tours to the Zhu Jiang River (Pearl River) Delta Area for a stay of less than 6 days organized by the travel services registered in Hong Kong or Macao, shall not need to apply for a visa. The Zhu Jiang River (Pearl River) Delta Area refers to the following cities: Guangzhou, Shenzhen, Zhuhai, Foshan, Dongguan, Zhongshan, Jiangmen, Zhaoqing and Huizhou. 5. Citizens of the following countries holding ordinary passports, and in group tours to Hainan Province for a stay of no more than 15 days organized by the international travel services approved by the National Tourism Administration of China and registered in Hainan Province, shall not need to apply for visas: the Philippines, the United States of America, Malaysia, Thailand, Republic of Korea, Indonesia, Germany, Britain, France, Austria, Italy, Russia, Switzerland, Sweden, Spain, Netherlands, Canada, Australia, New Zealand, Finland, Denmark, Norway, Ukraine, Kazakhstan, Japan and Singapore. Among those mentioned above, a tourist group of citizens of Republic of Korea, Germany and Russia may stay for no more than 21 days. 8. A holder of a valid Residence Permit for Foreigner in the People's Republic of China issued by the Public Security organs in China. * Those enjoy visa exemption to China as mentioned above are required to apply for Z, X1, Q1, S1, D, J1 visa accordingly before they enter China, if they go to China for work, study, family reunion, long term family visit, permanent residence or as resident foreign journalist. 1) Passport – Original passport that is valid for at least another 6 months with at least one blank visa page, a photocopy of the passport's information/photo page and emergency contact page. The previous old passport, if available, is required to be submitted; if the old passport is lost, or the applicant never holds a passport before, please make a clear statement in the item 3.7 of the Visa Application Form. 2) Visa Application Form – Please submit truthfully completed and signed Visa Application Form of the People's Republic of China. Please type the answer in capital English letters in the space provided. Do not leave any field blank. Type N/A if the item does not apply. Application form of minors must be signed by their parents or legal guardians. 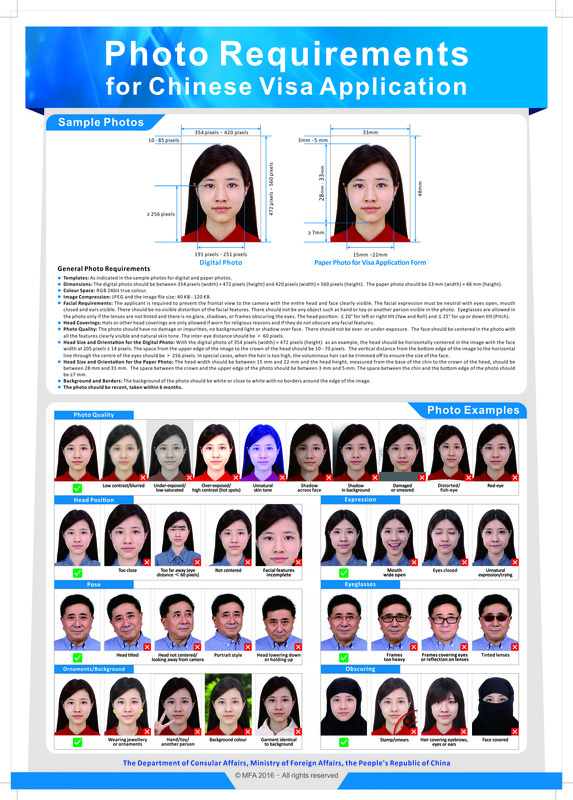 3) Photo – Please provide 2 color photos and affix one of the photos on the Application Form. The photo should be recent(within 6 months), front view, white background, in 48mm x 33mm size without head covering. (Specific photo requirements, please click here. ) Stapled/taped/clipped/detached photos will not be accepted. Guarantee letters issued by the foreign airlines or shipping companies, or invitation letters issued by the relevant organizations in China. The original and copy of Confirmation Form of Alien Permanent Residence Status in China issued by Ministry of Public Security. Visitor Visa for academic, cultural, scientific and other non-commercial activity visit. Invitation letters issued by Chinese organizations or individuals. *Those who visit China for commercial entertainment performance or shows, should apply for Z visa. A confirm connected passenger tickets for transit to a third country or region by an international aircraft, ship or train via China. Journalist Visa for resident foreign journalists in China. Visa notifications issued by the Information Department of the Chinese Foreign Ministry and official letters from the applicant's employer. Journalist Visa for foreign journalists who visit China for temporary news coverage. Visa notifications issued by the Information Department of the Chinese Foreign Ministry or other competent Chinese authorities and official letters from the applicant's employer. Travel itinerary and reservation of round-trip airline ticket and hotel, or Invitation Letter* (please see the remarks below) from China and the photocopy of the inviter's Chinese ID / Passport with Chinese Residence Permit. *Those who visit China for technical support, R&D, management or consulting etc., unless for any business activity regarding winning projects, or technical support or training for machinery equipment imported to China, or for any business activity for subsidiaries, branches or representative offices in China and will stay in China for less than 90 days, should apply for Z visa. *Those who visit China for film production (including advertisement and documentary), fashion shows (including car model, plane advertisement etc. ), should apply for Z visa. *Coaches, athletes who visit China for a trial for the purpose to be hired, should apply for Z visa. Family Reunion Visa for family members of Chinese Nationals or family members of foreign nationals with Chinese Permanent Resident Permit to stay in China for more than 180 days. Invitation letters from relatives in China who must attach a copy of his/her personal ID copy or Chinese Permanent Resident Permit, and original and copy of proofs of kinship. Family Visitor Visa for family members of Chinese Nationals or family members of foreign nationals with Chinese Permanent Resident Permit to stay in China for less than 180 days. Invitation letters from relatives in China who must attach a copy of his/her personal ID or Chinese Permanent Resident Permit. Visa notices issued by competent organizations in China. a) Dependent Visa for family members of foreign nationals who work, study in China to stay in China for more than 180 days. b) Visitor Visa for personal affairs to stay in China for more than 180 days. a) Invitation letters from relatives in China who must attach a copy of his/her personal passport, Residence Permit for Aliens, and original and copy of proofs of kinship. b) Documents supporting the purpose of visit. a) Family Visitor Visa for family members of foreign nationals who work, study in China to stay in China for less than 180 days. b) Visitor visa for personal affairs to stay in China for less than 180 days. a) Invitation letters from relatives in China who must attach a copy of his/her personal passport, Residence Permit for Aliens, and copy of proofs of kinship. Study Visa for studying in China for more than 180 days. The original and copy of Visa Application for Study in China Form JW-201 or Form JW-202. Study Visa for studying in China for less than 180 days. The original and copy of Admission Notice from China. * Those who visit China for technical support, R&D, management or consulting etc., unless for any business activity regarding winning projects, or technical support or training for machinery equipment imported to China, or for any business activity for subsidiaries, branches or representative offices in China and will stay in China for less than 90 days. * Those who visit China for film production (including advertisement and documentary), fashion shows (including car model, plane advertisement etc.). *Those who visit China for commercial entertainment performance or shows. * Coaches, athletes who visit China for a trial for the purpose to be hired. The original and copy of Employment Permit for Foreigner / Foreign Expert Permit / Notification Letter of Foreigner's Work Permit(copy is acceptable)/ Registration Certificate of Resident Representative Office/ Approval for Commercial Performance. * Commercial entertainment performance or shows for less than 90 days: The original and copy of Approval of Short-Term Employment for Foreigners Working in P. R. China and Approval for performance issued by a competent Cultural Department/Bureau. * Other short-term working for less than 90 days: The original and copy of Employment Permit for Foreigner and Approval of Short-Term Employment for Foreigners Working in P. R. China issued by a competent Department/Bureau of Human Resources and Social Security in China. 1) Information on the applicant : full name, gender, date of birth, etc. 2) Information on the planned visit: purpose of visit, arrival and departure dates, place(s) to be visited, relations between the applicant and the inviting entity or individual, financial source for expenditures, etc. 3) Information on the inviting entity or individual: name, contact telephone number, address, official stamp, signature of the legal representative or the inviting individual. 2)Previous Chinese Visa – If you had obtained a Chinese visa before, you should submit a photocopy of the visa, and if the visa is on your old passport, you should also submit the old passport. 3) Non-Filipino Nationals – Please submit proof of residence permit, employment or study in the Philippines. Temporary visitors to the Philippines should apply for Chinese visas from the Chinese Embassy/Consulate in the countries in which they live, unless the applicant can provide proof of employment/study or other occupational status and the visa officer will make the final decision on a case-by-case basis. You must also submit a photocopy of the Philippine visa/immigration entry stamp on your passport. 4) Certificate of Name Change – If the name in the new passport is different from that in the original one, the official document (birth certificate/marriage contract) issued by authorities for name change must be submitted. 5) Original Chinese Passport – First-time applicant whose former nationality was Chinese, or who was born in China (including Hong Kong, Macao and Taiwan), need to submit the original Chinese passport and a photocopy of the passport's information/photo page, and extension page (if applicable). You do not need to submit income tax return form and bank statement. 6) Visit Tibet – You may join a tourist group organized by Authorized Travel Agency. If you plan to visit Tibet individually, you may contact the Tourism Administration of the Tibet Autonomous Region (Tel: 0086-891-6834313; Fax: 0086-891-6834632) in advance and provide a Visa Notification issued by it. 7) Applicants applying for special tour to China (hiking, cycling, horse-riding, hot air balloon, or other expeditions) should provide an original of Invitation Letter for Tourist issued by Authorized Travel Agency. a) Tourism administration bureau of Chinese province, autonomous region or municipality directly under the Central Government. b) CITS Group Corporation, CITS Head Office, CTS Head Office, CYTS, etc. 8) Seafarers from the Philippine shipping companies to join vessels in ports in China and stay in China for less than 10 days, should submit Letter of Guarantee from employers, and the original and copy of Seafarer's Registration Certificate, and should apply for "G" visa. Those who would stay in China for more than 10 days should also submit invitation letters from China, and should apply for "M" visa. 9) American passport holders may apply 10 years multiple entries L/M/Q2/S2 Visa, or 5 years multiple entries X1 Visa, only if his/her passport is valid over 1 year from the date of application. 1) An applicant may submit his or her visa application in person or entrust someone (immediate family member/household staff/co-worker) or a travel agency to submit on his or her behalf. 2) No appointment is required. 3) Mail applications will not be accepted. 4) If necessary, the consular officer may require the applicant to provide other proof documents or supplementary materials, or require an interview with the applicant. 2) Express service (third working day release): an additional fee of 1100 pesos per visa will be charged. 3) Rush service (second working day release): an additional fee of 1700 pesos per visa will be charged. 4) Express and Rush service is not available to the First time Chinese visa applicant/ X1, X2 and Z visa applicant, please apply in advance. 5) Pay visa fees when collecting passport. 6) Only cash payment is accepted. 1) The application materials must be authentic and complete. Forged and incomplete applications will be denied. 2) The consular officer will decide on whether or not to issue the visa and on its validity, duration of stay and number of entries in light of specific conditions of the applicant. 3) According to the relevant Chinese law and regulation, the consular officer is not required to give reasons for refusing the issuance of a visa. 4) Please check the visa after obtaining it. Should there be any discrepancy, contact the Visa Office immediately. The duration of stay specified in the visa means the period of time during which the visa holder is allowed to stay in China after each entry. It begins from the next day of entry.